[phpBB Debug] PHP Warning: in file [ROOT]/ext/forumhulp/statistics/event/listener.php on line 167: file_get_contents(http://ip-api.com/json/18.215.159.156?fields=status,countryCode,reverse): failed to open stream: HTTP request failed! Greetings and welcome to Facebook Fridays! for September 12, 2014. This week we're featuring our line of Lodestone products. Lodestones -- chunks of naturally magnetic iron ore -- are prized in folk magic for their "drawing" power. They are a vital ingredient in African-American hoodoo practice, held in high regard as a Powerful Amulet and all-around Good Luck Charm because the Lodestone's Magnetic Influences are supposed to attract Power, Favours, Love, Money, and Gifts. 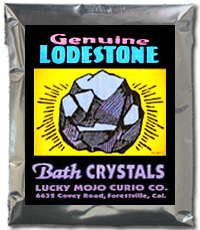 Our LODESTONE dressing oil, incense, sachet powders, and crystals for bath or floor wash all contain pieces of genuine live LODESTONE! This week FIVE lucky winners will find out about the power of the Lodestone. To the first person whose name we draw, we will send a complete Lodestone Spell Kit, with full instructions and all ingredients. 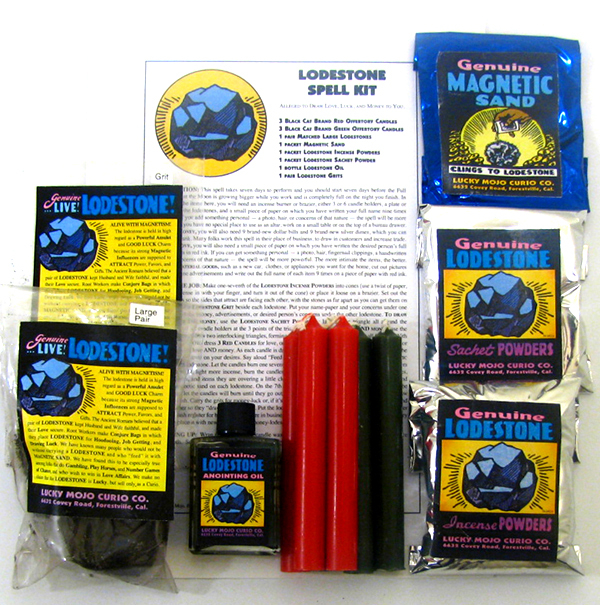 Our second winner gets a fixed and prepared Lodestone Mojo Hand with instructions for use. And our final three winners will each receive a foil pack of Lodestone products: either Lodestone Bath Crystals for floor wash or bathing, Lodestone Self-Lighting Incense Powders to smoke objects or rooms, or Lodestone Sachet Powder for dressing petitions or business cards. then scroll down, and post a comment to the Facebook Fridays! status message for September 12, 2014. First thing tomorrow morning, we will select FIVE winners at random, and ask them to message the Lucky Mojo Curio Company Facebook Page with their mailing addresses, so we can send them their FREE Lodestone products. Thanks for the notification, Ernie! Get on over to the Facebook page and enter to win, folks! We have a winner! In fact, we have FIVE lucky winners! Our Facebook Fridays! winners for September 12, 2014 are: Renee Petruna, Marlon Lamark Richardson, Danette Wilson, Louis Crockett, and Jacqueline Tsuki Hikari Eccleston.